Gaming has become an undisputed part of our culture over the past three decades, and Game Based Learning (GBL) in education will become increasingly embedded in 21st century curriculum. Gaming is an industry that has shown accelerated growth, with various sources all showing a high percentage of the population regularly playing games, thus increasingly becoming a fundamental part of modern cultures (Oblinger, 2009). Spector et al. (2010) contend that GBL should be part of learning and instruction in a digital age; and as Hagevik (2011) explains, GBL learning is where problems are solved in real time, and collaboration, creativity and communication constantly take place (p. 16). 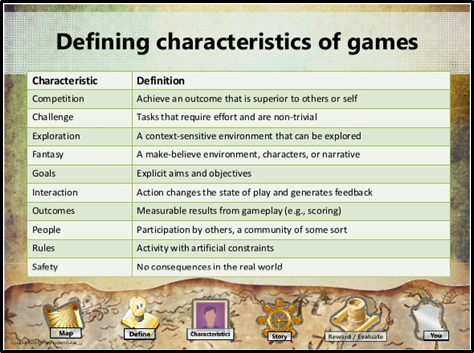 Games however need careful pedagogical consideration regarding their introduction into a classroom, focusing on the design and contexts that underpin them. This involves reimagining existing curriculum and how it could be adapted to include GBL to increase learning, making students more involved, attentive and motivated (Ott & Tavella, 2010, p. 2). Admiraal et al. (2011) explore in their research how in education games can trigger factors that feed student motivation including challenge, curiosity, control, fantasy, competition, cooperation and recognition (p. 1186). Games do cover an incredibly complex nexus of information, and requires teachers to have knowledge of the game’s environments and structure (Hutchings-Mangion, 2017a, para. 8). The playing of games gives educators the opportunity to introduce layers for conceptual learning and new taxonomies for pedagogical design, and herein educators are understanding the complex learning that it can involve (Steinkuehler, Squire, & Barab, 2012, p. 271). The best games are those which appeal to a teacher’s students and that can be put to work in the classroom in association with other tools (Hutchings-Mangion, 2017a, p. 5). The challenge remains to develop this contemporary approach to GBL in conjunction with changing curriculum requirements. This study is focused on how GBL is introduced into a senior History classroom as a way to conduct revision, and how students reflect on the Breakout Edu as a GBL tool and its impact on their learning. Using GBL allows the teacher to present the topics and learning in multiple ways (Ke & Grabowski, 2007, p. 249). As Serrano (2004) discussed, games can strengthen students’ knowledge, skills and attitudes towards a topic, because it can be more engaging and increase motivation levels for a student in comparison to traditional learning techniques. It’s through the use of the Breakout Edu integration that students for this study further develop their media literacy with the focus on textual and visual literacy regarding the inquiry topic. The participating school is an Independent, Co-educational, P-12 school located in regional Queensland, Australia; approximately 3 hours north of Brisbane. The school has a student population of 780 students between the ages of 5-18. This study involved the Year 11 and Year 12 Modern History students completing a unit on the French Revolution. In Queensland the senior subjects are prescribed by the Queensland Curriculum and Assessment Authority (QCAA, 2017a), with schools following an approved Modern History Syllabus (QCAA, 2017b), work program and required number of assessments. 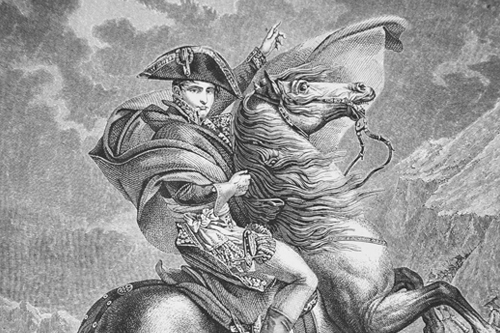 The unit for this study is on the French Revolution, part of ‘Studies of Nationalism’; exploring the conditions in France before 1789, the outbreak of the revolution and ‘Reign of Terror’. The assessment is an extended written response to sources in essay format. The unit involves a detailed account of the political, social and economic issues affecting France in the 1780s, and is taught using a number of strategies. The content is delivered through the use of conventional teaching methods, with a dominant teacher centred pedagogy; as well as utilising, various digital methodologies to supplement and enhance students comprehension of the topic. Initial lessons involved slides, readings and analysis activities; this is supplemented with YouTube, online activities, in-class role-play and quizzes. Some of the key skill areas that the school is encouraging is critical thinking and collaboration. The teacher also wanted to explore different ways to integrate GBL into revision and to assess students understanding of the topic areas. Utilising a system like Kahoot had been proven successful in the past, but did not encourage or build the skills of critical thinking or collaboration. A decision was made to use Breakout Edu to do revision and build on these skills, and then to evaluate the effectiveness of utilising this strategy. Breakout Edu is similar to the popular ‘escape room’ game, but it has a marked difference in that this game is about opening a locked box. It is a timed challenge that involves solving puzzles, discovering clues, finding hidden items, red herrings and ultimately figuring out how to unlock a series of locks to open the box. The sessions have an underlying theme or story that underpins each Breakout, focusing on collaboration and problem solving. Breakout EDU is often used to introduce new concepts, reinforce learning, bring closure to a unit, and reinforce skills and concepts learned, all in a fun way (Goerner, 2016). Their website describes it as an “immersive learning games platform.” (BreakoutEDU, 2017a). 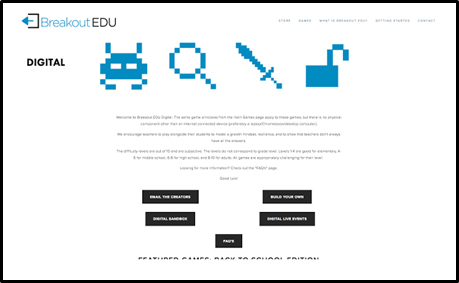 The website contains a number of tutorials, links and free games; and covers all subject areas and age levels. It also has a growing community of educators on various Facebook groups that are regularly sharing ideas, resources and supporting one another. 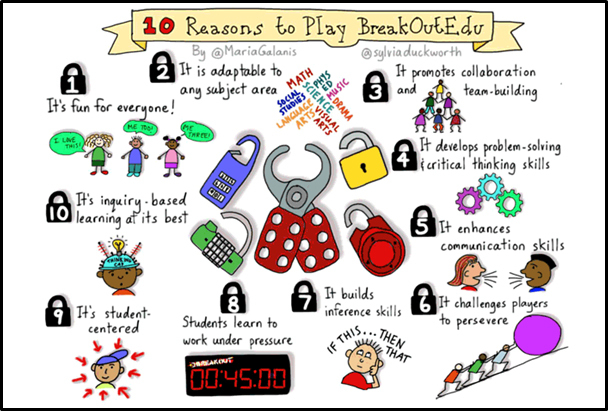 Sylvia Duckworth, a well-known educator that creates engaging sketch notes, showcases the top ten reason to play Breakout Edu with this sketch note based on the work of Maria Galanis (2016). At the end of the unit there were four revision lessons set aside to prepare for the written exam. In the first lesson the standard method of recapping the unit, including revision essay questions and the fourth lesson source analysis practicing questions. The middle two sessions were divided into a digital and a physical Breakout Edu sessions. The second revision lesson was focused on creating a physical game to focus on the main content areas and challenge students to work collaboratively to solve the mystery. 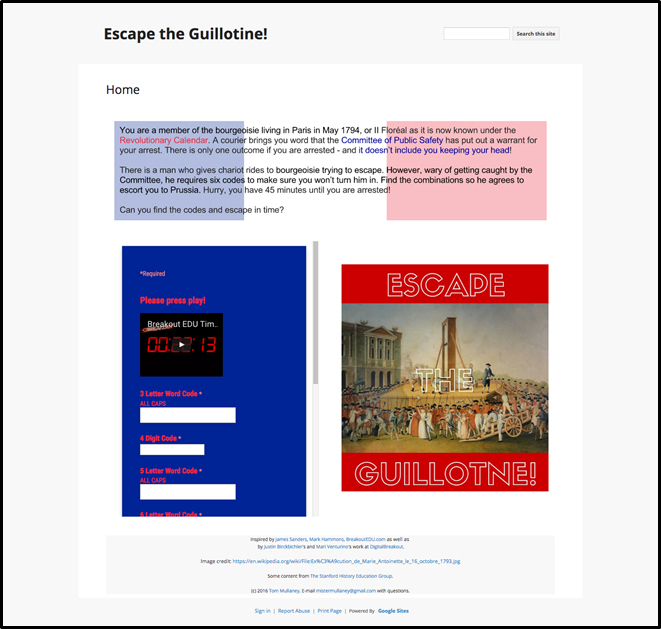 The game created was titled ‘Bastille Day’ and the storyline involved Maximillian Robespierre, a key revolutionary figure, trying to recover vital letters locked in a box in the Bastille before the storming of the Bastille takes place and they get destroyed. The room is set up with the box placed in the centre of the room, with 5 different locks on it. These include a standard key lock, word lock, directional, and two numerical locks. Around the room are various posters organised, some with QR codes, algorithms, cryptic clue words, and even messages written in invisible ink. At the start of the session a short script is read out and then the students need to start exploring the room, in which they will find another small box that has the black light torch for the invisible ink. The various clues lead them to websites that contain short videos, digital puzzles that need to be constructed, short games to progress through and ultimately lead them to an answer that will unlock a lock. Then they repeat the process. The riddles and clues progressively become more difficult to solve and involves a lot of lateral thinking. The room was filled with tension as there is a countdown timer playing ominous music in the background. The students moved around the room, with various personalities leading discussions, but others emerging with valuable ideas. The game pushed the group to work together, to communicate, to collaborate and to think critically. They managed to work though the clues with precision, but then became ‘stuck’ for a long period of time on a YouTube video montage. At this point they used their ‘HINT’ card and the teacher pointed them in the right direction. The group eventually would open the final lock with 4:42 minutes left on the countdown clock. The group discussion afterwards was used to explain the clues in more depth and debate the game elements. The students were engaged throughout the session, and the excitement of the group contributed to their enjoyment of the game. It was however their comments during discussions that demonstrated the impact of each clue inquiry had on their understanding of the topic areas. They commented that “now I understand the role of taxes in developing the hatred towards the King”, or “wow, that video was challenging to solve, but really showed the ‘Enlightenment’ viewpoints in detail.”. Another student mentioned that, “the Third Estate’ had no choice – now I understand. The puzzle sequence really put it in perspective.” Overall most of the students enjoyed this game as a method of revision. The third revision lesson involved a Digital Breakout. Digital Breakouts differ from the physical Breakout box as it involves doing the game completely online. The website lists that the games are categorised in various subjective difficulty levels, and provides access to a range of games and templates to create your own game. 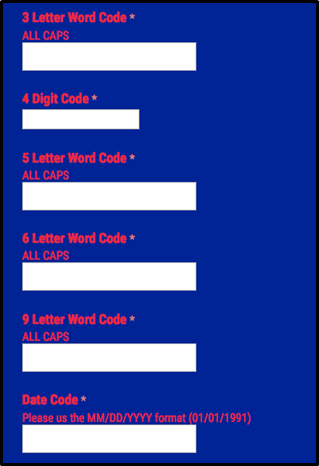 On this page, there are hyperlinks hidden in the text and image. These link to videos, quizzes, puzzles, maps and articles. There they will have to figure out the correct ‘lock’ answers to ‘unlock’ the game. Once they figure out a clue they enter it into one of the ‘locks’ (see below). The students were divided into pairs, explained the game and immediately began with intensity; which soon it turned to frustration and panic. There was shouting and complaining, a few ‘eureka’ moments and lots of discussions taking place. As they started achieving success, the motivation and excitement levels increased. Eventually they managed to all get through the various clues and riddles, and ended up cracking all the locks. Figure 7: Which area of the French Revolution unit do you struggle with? Figure 9: Did this Breakout help you understand or visualise aspects of this unit better? As can be seen from the surveys, the majority of students enjoyed it and described it as being ‘fun’ and ‘challenging’; exactly what the aim of the activity involves. The ‘Reign of Terror’ is the area of the unit that many identified as the most difficult to grasp, and with this game being focused on the events it allowed them to connect many of the missing pieces in their understanding. More than 90% indicated that it improved their understanding of the concepts, and the range of post-game discussions proved invaluable in extracting and elaborating on ideas. The Breakout EDU games were successful in improving the student’s comprehension of the study area, and reinforced the foundations of the unit. 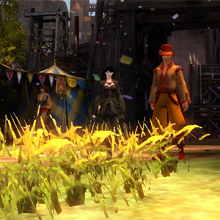 The games clearly followed Whitton’s defining characteristics of games (2009), and showcase elements of ‘Flow’ in the process of participating in the game. The games allowed storytelling and discovery to be the central theme, and as Allen (2001) describes it that students learn best when immersed in storytelling experiences. This lends to the enjoyment of the experience, a key marker of success and involvement levels according to Fu et al. (2009). 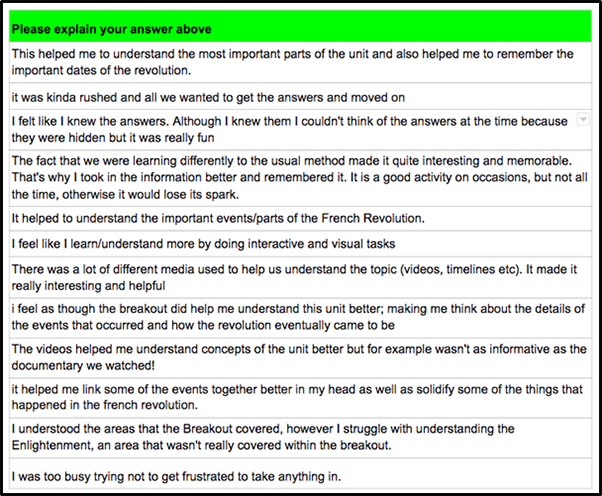 The unknown elements of the Breakout EDU challenges and confuses participants, this exemplifies how the progression is part of cognitive constructivism and how students construct their own understanding. The riddles and puzzles also resulted in social interaction between group members creating multiple stories, similar to social constructivism. Another element of the Breakout EDU game involved the cooperative group dynamics and competition. Ke & Grabowski (2007) stated that, “Cooperative learning occurs in small groups of students who work together to maximise their own and each other’s learning” (p. 250). This was clearly seen with the discussions of the group, debating of the puzzles, riddles and clues; the forming of smaller groups to work quicker. Even with the digital Breakout EDU the pairs worked with one another to try and solve it together, rather than being individual and one not contributing. Admiraal et al. (2011) found that students learn more when they are left engage with a game in a group competition, (p. 1185). The uncertainty of what to do was both an added contributor to engage their interest, but also hindered some due to their own in-built inertia or resistance (Hutchings-Mangion, 2017c, p. 2). The uncertainty is a key element in this game, and educators would need to be aware of strategies to overcome the resistance. That is why Beavis et al. (2016) states that, “Teachers need a pedagogical strategic understanding of working with games to make sure they’re used effectively and appropriately” (p. 577). As well as how Arnab et al. (2012), explain that the teacher needs to place themselves in roles as instructor, playmaker, guide and explorer to develop students understanding of GBL as part of their learning. All these elements and theories result in making Breakout EDU a viable and excellent GBL option for teaching. 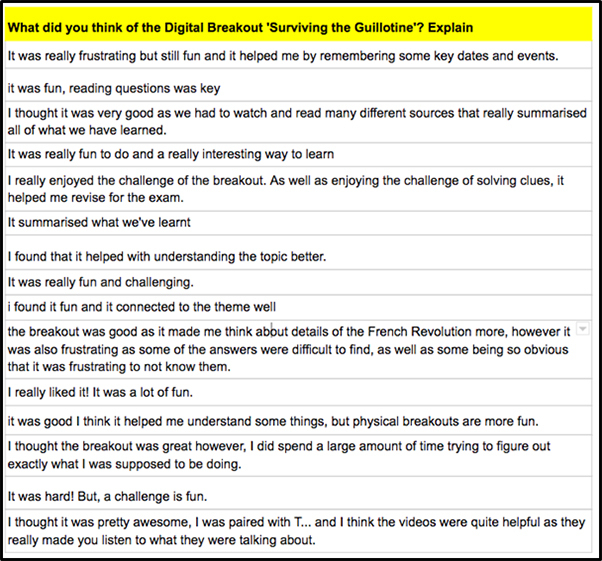 The student’s engagement, increased levels of understanding and higher performance on the essay exam all form a solid argument for Breakout EDU and its application in providing a highly engaged GBL environment in all subject areas. Jonassen, D. H. (2006). On the role of concepts in learning and instructional design. Educational Technology Research and Development, 54(2), 177–196. Ott, M. & Tavella, M. (2010). Motivation and engagement in computer-based learning tasks: investigating key contributing factors. World Journal on Educational Technology, 2(1), 01-15. Retrieved from http://www.world-education-center.org/. Rosas, R., Nussbaum, M., Cumsille,P., Marianov, V. Correa,M., Flores, P., Grau, V., Lagos, F., López, X., López, V., Rodriguez, P., Salinas, M., (2003). Beyond Nintendo: Design and Assessment of Educational Video Games for 1st and 2nd Grade Students. Computers & Education, 40(2003), 71-94. Serrano, E.S., (2004). The evaluation of food pyramid games, a bilingual computer nutrition education program for latino youth. Journal of Family and Consumer Sciences Education, 22(1). Spector, J. M., Ifenthaler, D., Kinshuk, P., & Isaias, P. (2010). Learning and Instruction in the Digital Age. Dordrecht: Springer. Stripling, B. (2007). Assessing information fluency: Gathering evidence of student learning. School Library Media Activities Monthly, 23(8), 25–29. Whitton, N. (2009). Learning with digital Games: A practical guide to engaging students in higher education. New York and London: Routledge. Case studies, environmental scans, situational analysis, or other activities that illustrate games-based learning in action. Gold Rush – Using Minecraft EDU to reimagine Stage 3 teaching of the gold rush years. What can playing (and designing) games teach us about learning? School of Information Studies, Charles Sturt University, 2017.